Changes in the proportion of part-time faculty in two- and four-year institutions between 1988 and 2010. Source: "Academic Performance in Community Colleges: The Influences of Part-Time and Full-Time Instructors"; American Educational Research Journal. As part of their pursuit for student success, community colleges might want to return to the days where tenured faculty were the norm and not the exception. Given the lengthy rise in the use of adjunct instructors at two-year institutions, a researcher recently undertook a study at a large community college system to see what impact the use of non-tenure-track faculty had on student outcomes. According to Di Xu, an assistant professor in the School of Education at the University of California, Irvine, an initial rise in grades in introductory courses taught by part-timers eventually reversed itself in subsequent courses. Xu's research results were recently published in the American Educational Research Journal. 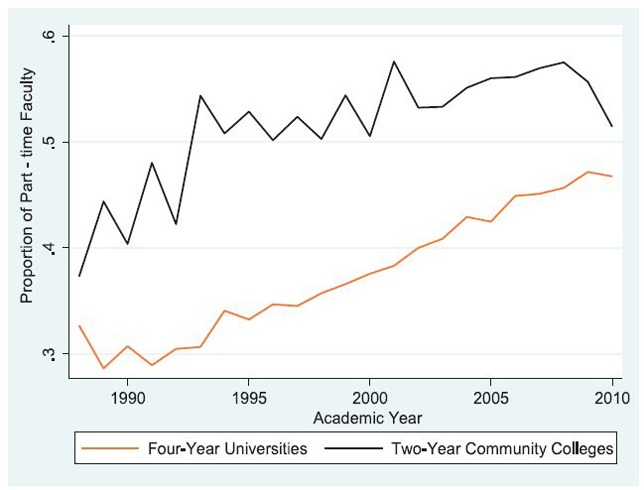 As Xu wrote, data from the National Center for Education Statistics showed that the use of adjuncts has changed across all kinds of schools, but more dramatically so for open-access two-year colleges. Before 1970, she reported, the ratio of full-time faculty to part-time in that type of institution was "roughly" 2:1; by 2003, it was reversed: 1:2. The question Xu posed in her latest research was whether community college students were "likely to receive the same quality of instruction" from the part-time faculty as they did from the full-time instructors. Xu had explored a similar theme in a previous project undertaken with Florence Xiaotao Ran, a research associate at the Community College Research Center, where Xu is a research fellow. In that study they established that non-tenure-track faculty negatively influenced subsequent course enrollment and performance in both two- and four-year schools. However, the non–tenure-track faculty in that study was made up of instructors working both part-time and full-time. The more recent project explored the impact of part-time teachers, specifically. Xu analyzed data from 151,541 students taking their first introductory courses between 2004 and 2009 at an unnamed system with 23 community colleges. She found that while the overall course withdrawal rate was 11.4 percent for intro classes taught by full-time instructors, it was 10.6 percent in the classes taught by adjuncts. And those courses taught by adjuncts had an average grade of 2.71 compared to 2.44 for those taught by tenured faculty. As Xu explained, this difference is nearly equivalent to the difference between an A- and a B+. Positive links disappeared, however, when it came to subsequent course enrollment and success within a particular field of study. Students who had greater exposure to adjuncts in a given field of study had a lower probability of attempting additional courses in the same field (39 percent vs. 45 percent). And among those who enrolled in another course in the same subject, Xu found those students were less likely to pass the next course — if taught by an adjunct instructor — by five percentage points (78 percent vs. 83 percent). Among students who did enroll in another class, adjunct instructors had a negative impact on their likelihood of passing the next class by three percentage points. The negatives associated with the use of the part-time adjuncts was particularly acute in STEM and health fields, she noted. As the researcher suggested, "Adjunct instructors excel in promoting contemporaneous course performance but are comparatively less effective in inspiring students' interest in a particular field and preparing students for follow-on learning in the same field." These findings are "worrisome from a policy perspective," she added. If the same results surfaced in other state community college systems, "it would imply that the continued increase and heavy reliance on part-time adjuncts in those schools "could harm the education outcomes of these students who are already disproportionately from historically disadvantaged groups." The report is available to subscribers of the American Educational Research Journal.